So many fun ideas to dress up the party from cake toppers to little mint holders to fun little charms to hang on a necklace, bracelet or keychain! Whatever you choose to do with these little trinket size wonders, we hope you have fun & enjoy making them. One of these in either size can be worked up in as little as 5 minutes, so let the creative juices flow and start your baby shower party planning today! There are 3 different ways to obtain this pattern, you can click on the link below for the written on YarnWars, join our Facebook group and grab the pdf from the Files tab, or we have a full video tutorial for both of these sizes available on the YouTube channel! If you have enjoyed this pattern, I would love to know! Feel free to post a comment below, and please come on over to the group and show us your workups! The YarnWars community on Facebook is active, fun & full of support! 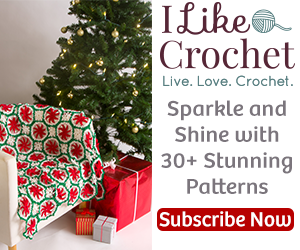 You will be joining over 30,000 crocheters, knitters, loomers and more from around the world! Thanks so much my friends! See you soon! Thank you, Colleen, for generously sharing your patterns with us. Love the Mini + Bitty Mary Janes. Will make some for an upcoming baby shower.